The Prices below are for guide purposes only as each Portrait will be different. A price will be quoted to you on enquiry, including postage and packaging and will not vary greatly from the guide below. Once you have decided the medium and size of your portrait, you should contact David with a photo of your choice and agree details such as; medium, size, and how much of the subject you want included ie. head and shoulders or full body, this will affect the price. A good quality photo is required and more than one would be helpful. Other sizes can be arranged on request. 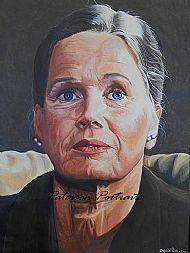 Once details have been agreed, you will be quoted the full price of your portrait including any postal charges. When you are satisfied with the details and price, you can Commission a Portrait by paying the 30% deposit required before any work will commence. Deposits will only be refunded in the event that your portrait is not completed or delivered in good order, or you change your mind within 28 days from payment date,without question. Once your unique work of art is complete, you will receive a photo for approval, then full payment can be made and your portrait sent to you. Prices are subject to change, get your quote today. Graphite portraits can be commissioned on 3 sizes of Artists paper. Contact David to discuss alternative sizes.